(McLean, VA – January 03, 2019) FN America, LLC has supported Baltimore County Police Department, above and beyond the call of duty, in their transition to the FNS™-40 pistol. The company made every effort possible to work with the department to alleviate officer concerns and to instruct the department on standard maintenance procedures. FN America, LLC acknowledges the company was aware of occurrences of officer-induced accidental discharges with the FNS-40 pistols used by Baltimore County Police Department over the past five years. 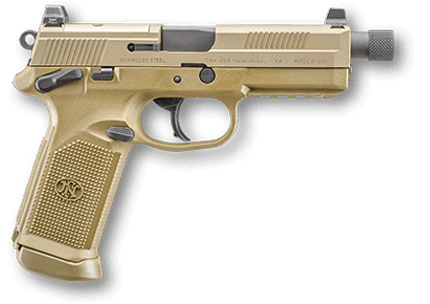 FN America, LLC is also aware that a report, generated by an independent testing lab following the first incident, certified that there was no manufacturing defect present that could cause the pistol to misfire. This report attributed the incident to an officer-induced accidental discharge. Baltimore County Police Chief Terrence Sheridan provided two reasons in his Emergency Justification for a Replacement Service Weapon dated Oct. 30, 2018. The first being a reported condition that could cause the FNS-40 pistol to delay fire under a very specific set of unlikely circumstances, originally reported by an Arizona police department. Under manipulation in a closed lab setting, the slide of the FNS-40 was moved out of battery at a very small and specific distance and the trigger was pulled. The pistol functioned as designed and did not fire. However, it was discovered that if the trigger was held to the rear, the pistol could delay firing until the slide moved back into battery, or if force is removed from the trigger and the slide moves back into battery. FN has no knowledge of the condition ever occurring outside of a lab environment. Nevertheless, FN immediately addressed this potential condition with both the AZ department and BCPD by replacing the striker in each FNS-40, at no cost to either agency. FN subsequently posted a Service Bulletin to the public with an offer of a free striker upgrade for those who wished to send their pistol in. Second, Chief Sheridan describes the potential of a catastrophic failure, attributed to three firearms out of 1,920 FNS-40 pistols in service with BCPD. Three pistols experienced a trigger pin either backing out or moving slightly out of position. This trigger pin is a component that requires routine maintenance and should have been replaced according to the armorer’s manual provided to Baltimore County Police Department range staff. It is unclear whether BCPD range staff previously serviced any of the FNS-40 pistols in their possession according to the armorer’s manual provided. However, BCPD Police Chief Terrence Sheridan noted in his Emergency Justification for a Replacement Service Weapon dated Oct. 30, 2018, that BCPD range staff were able to quickly replace this trigger pin, returning the three FNS-40s to service. Through both internal and independent testing of the FNS-40 pistol, FN America, LLC can emphatically refute the presence of any manufacturing defect that could potentially have caused Baltimore County’s officers to experience accidental discharges. FN America also asserts that if the FNS-40 pistols had been properly maintained, the occurrence of “catastrophic failures” described by BCPD would have been extremely unlikely. The FNS pistol has been tested thoroughly and certified for law enforcement duty use. We stand firmly behind our product, our testing and quality practices.